This year we've had an explosion in the snail population. Chili plants seem a favorite. Wifey left one of her coconut shells on the chili plant raised bed after drinking the milk. 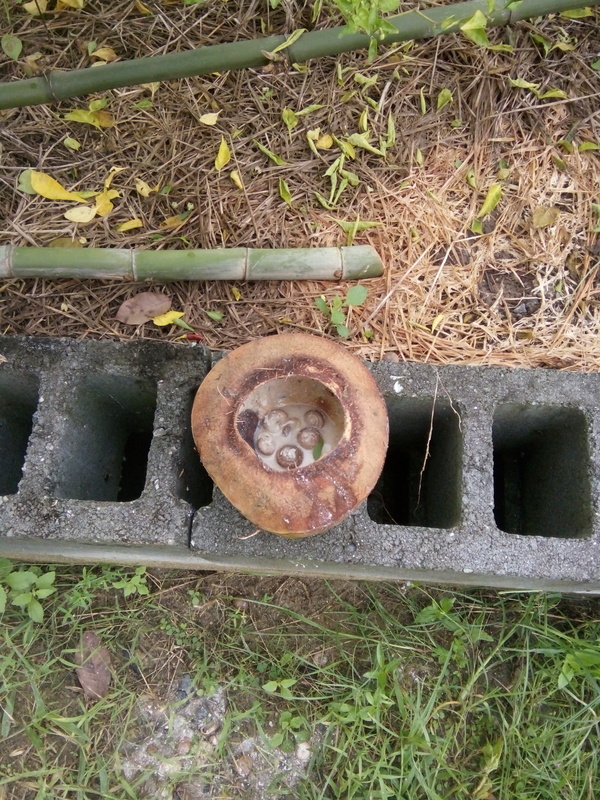 Today we noticed it was full of snails after the thin layer of coconut flesh. It has also filled with water. There were more snails in it until the puppy knocked it over. Anyone else using this method? Now putting more round the chili. I wouldn't go wandering round here at night, too much wildlife you wouldn't want to meet. Leave that to the tappers. Oh....so you live right off of Sukhumvit Soi 11 then ? And ducks. A famous quote from Bill Mollison, founder of Permaculture: "You don't have a snail problem, you have a duck deficiency"
Our ducks would wipe out my garden in a day. This kind of advice is applicable to gardens where there is nothing growing worth keeping. Never heard of this before .a nonalcoholic version of the beer trap. Must be the smell that attracts them .